Additional research provided by Philip McFee. The Durham Herald-Sun traces its roots to 1894, when three staff members of the struggling Durham Daily Globe- Zeb Council, W. W. Thompson, and a printer named Gates- started a new paper called the Durham Globe-Herald, releasing the first issue on 15 Oct. 1894. A few weeks later the men bought a printing outfit from W. Whitaker, from whom they previously had rented a press. The small operation was fragile and, to give it some financial stability, a flat weekly price of five cents was suggested by Joe H. King, who actively joined the operation on 13 Nov. 1894 (although he had advised the original trio from the beginning of the project). The collection of that fee kept the paper afloat when many other newspapers succumbed to the tumultuous economic times. In January 1895 the paper became a morning daily and the name was changed from the Durham Globe-Herald to the Morning Herald, as it remained until 1919. On 8 Feb. 1895 Thompson sold his interest to Edward Tyler Rollins, and the newly formed King and Rollins Company assumed direction of the paper. In the partnership, Rollins primarily handled finances and King attended to editorial and journalistic matters. As coverage broadened and circulation increased, the paper's operations were repeatedly moved to more suitable locations. Eventually a building specifically designed to meet the needs of the Morning Herald was completed in 1906. The budding publication likely could find no better locale than Durham at the beginning of the twentieth century. Circulation grew with the vast influx of people to the area, stemming from the Duke family's relocation of Trinity College to Durham in 1892 and the expansion of local businesses, be it the flourishing tobacco industry or successful companies like the North Carolina Mutual Life Insurance Corporation, founded in 1899. As the future paper of record for a county on the rise, the Morning Herald acquired a vital social and political voice in the community. Technological advances also accounted for the escalating readership. As the paper grew, opportunities developed for the purchase of more advanced equipment, such as the Linotype. The Linotype, which could set an entire line of print on a metal slug and was operated by a keyboard that resembled a typewriter, so increased efficiency that it made the employment of full-time workers a necessity. In 1917, a few months before his death, King retired and sold his shares in King and Rollins to Edward Rollins and Carl C. Council, who had started in the Herald as a courier and eventually rose through the ranks to the position of circulation manager in 1921. In April 1918 the King and Rollins Company formed a corporation. In August 1919 it obtained an Associated Press franchise, and on 5 Oct. 1919 the Morning Herald became the Durham Morning Herald. The Durham Morning Herald obtained its local rival, the Durham Sun, in 1929. The Sun moved to the Herald's headquarters and began to use the name Herald-Sun. Although the two papers were published and managed in the same building, they maintained separate editorial staffs. The work of the Herald and the Sun remained a significant factor in promoting the continued growth of Durham, which, with the presence of Duke University and Duke Hospital, became known as the "City of Medicine." 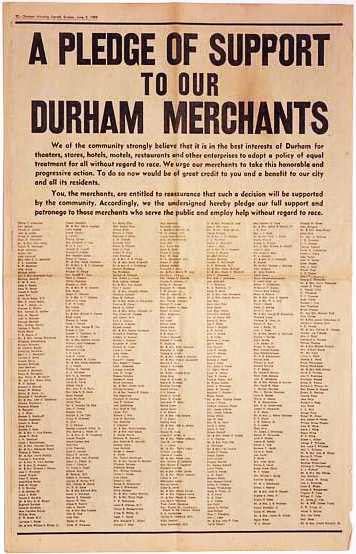 The papers became central news and information sources for Durham, Orange, and Chatham Counties, which would enjoy substantial growth in population later in the century. On 22 July 1931 Rollins died and left his three-fourths interest in the Herald and the Sun in trust and the positions of publisher and president to Carl Council. The papers continued to expand, purchasing Durham's primary news radio outlet WDNC in 1936 and maintaining it for almost two decades. Despite its diversified business dealings, the newspaper remained a family institution. At Council's death on 29 Jan. 1964, Steed Rollins, son of the late Edward Rollins, became publisher and president. In December 1981 Steed Rollins announced his retirement and turned over his positions to his brother Edward T. Rollins Jr., but Steed remained chairman of the board until his death in November 1985. Edward retired in 1988, passing his duties as publisher and president on to Richard J. Kaspar, who had taken a vice presidential position in the organization in November 1987. On 1 Jan. 1991 the Durham Morning Herald and the Durham Sun merged to form the Durham Herald-Sun. William E. N. Hawkins remained executive editor, and Carlton Harrell, editor of the Sun before the papers merged, became associate editor of the Herald-Sun. Kaspar oversaw the merger and continued as publisher and president until his death in 1995. The Durham Herald-Sun has occupied an odd niche in the state's communications market. Although in the early 2000s it boasted a daily circulation of more than 50,000, it barely made the top ten highest circulating newspapers in North Carolina. Durham's proximity to Raleigh puts the Herald-Sun in direct competition with its powerful neighbor, the Raleigh News and Observer-a geographic factor not present in Charlotte, Greensboro, Fayetteville, or any other relatively insulated towns with major papers. As a result of this proximity, the 150,000-plus circulating News and Observer tallies numerous subscriptions in Wake, Durham, and Orange Counties. Nevertheless, the Herald-Sun maintains a significant readership by focusing on local interest stories, especially in Durham and Orange Counties, including regular coverage of popular competitive sports at Duke University and the University of North Carolina at Chapel Hill. The Durham Herald-Sun was one of the few remaining independent dailies in the state until December 2004, when the Rollins family sold the paper to the Paxton Media Group, a Kentucky company started in 1896. The Herald-Sun and its approximately 350 employees became Paxton's 29th paper, as well as its largest. L. S. Laprade, "Morning Herald Had Modest Start," Durham Morning Herald, 15 Oct. 1934. "Rollins Retiring from Newspaper," Durham Morning Herald, 5 Dec. 1981. "Durham - Herald." The E.S.C. Quarterly 9. No. 1-2. Winter-Spring 1951. p.24. http://digital.ncdcr.gov/u?/p249901coll22,451988 (accessed September 6, 2012). Dixon, Wyatt Thomas.. How times do change: a series of sketches of Durham and her citizens. Durham, N.C.: Central Carolina Pub. 1987. Moore, Harold E. The Herald-Sun 1819-2004. Durham NC: H. Moore. 2005. 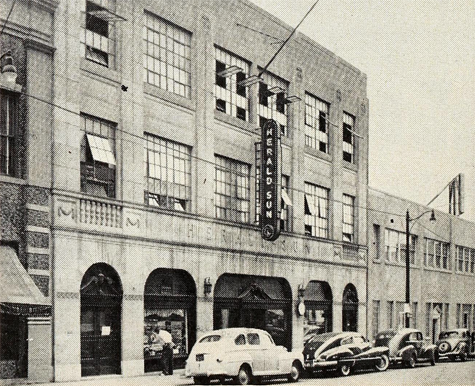 "Renovated and modern home of the Durham Herald-Sun papers. Recently acquired annex to the right houses Business and Circulation Departments. Engraving Department occupies a fourth floor at the rear." The E.S.C. Quarterly 9. No. 1-2. Winter-Spring 1951. p.24-25. http://archive.org/stream/escquarterlyv912nort#page/n29/mode/2up (accessed September 11, 2012). "Newspaper Section, Accession #: H.2011.91.1." Durham, N.C. 1963. North Carolina Museum of History. Durham no longer has a “local” newspaper nor radio station. Lost in the shuffle of pursuit for/of technologies to distribute the same repetitive “news stories” only faster (but haphazard). Why not publish ONE paper with 2-3 sections to ID/cover Wake/Durham/Orange/etc. Id buy that. E-editions are ripoffs to sell more papers.